Pura Tanah Lot is one of the temples located on the island of Bali. This temple is one of the largest in Bali, and is often used as one of the major tourist destination of Bali, by local and foreign tourists. This temple is located in the Village area of Beraban, district of Kediri, Tabanan regency. Temple was built as a temple of the sea, a place of worship the gods guard the sea, and is a part of the Pura Dang Kahyangan. One of the most interesting of these temples is often held religious ceremonies involving many religious believers who worship in Hindu temples. In addition to many visitors Hindu religion, ceremonies and activities also attract the tourists who just want to see the uniqueness of the activities carried out. The activities carried out in the temple of which this is Tanah Lot Odalan. Odalan a feast was held around 210 days. To go Tanahlot, then visitors can use private vehicles or vehicles that have been hired. If we are out of Denpasar, then to go Tanahlot, heading west. Distance from Denpasar to Tanah Lot is approximately 30 kilometers. 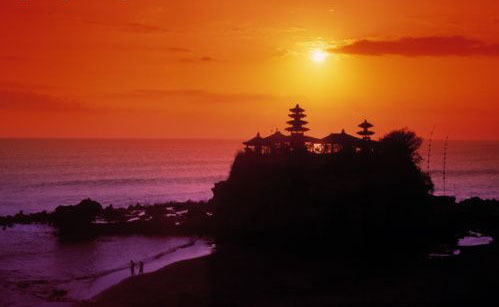 If taken from Kuta, then Tanah Lot can be reached by traveling about 43 kilometers. If from Tabanan city, then Tanah Lot can be gone within a distance of 11 kilometers. Ticket price to enter the land area is reasonably priced lot, which is 10000 of rupiah for adult local tourists, travelers and 7500 of rupiah for local children. For foreign tourists, the admission price is 30000 of rupiah for adults, and 15,000 of rupiah for the children. Tickets will be open from 07.00 am until 19.00 pm.